Everyone performs better on web sites where the interaction matches users' goals; where navigation and information are grouped well; where navigation elements are consistent and follow conventions; where writing is clear, straightforward, in the active voice, and so on. And, much of what makes up good design for younger people helps older adults as well. For example, we know that most users, regardless of age, are more successful finding information in broad, shallow information architectures than they are with deep, narrow hierarchies. When web sites make their sites easier to use for older adults, all of their users perform better in usability studies. The key is involving older adults in user research and usability testing throughout design and development. There are some important considerations in working with older adults in studies. Remembering the points below will ensure that you and your participants have a good experience and you get the data you need to inform design decisions. In many places in the world, older adults outnumber people in other age groups. The question is, how do you find the right people to take part in studies? They can be difficult to get to. Community web sites, message boards, or chat sessions. The oldest old tend not to take part in these groups, so posting ads in those places is not a fruitful way to find participants. Senior centers and community colleges. These are places that offer classes in using computers. If you want computer and web novices for a study, they might be good places to find appropriate participants. They are not good sources if you want to observe people with enough web experience to see them working at a web site without teaching them. Flyers at a senior center, when they did not make clear that we were recruiting for a study. Many older people are much more cautious and skeptical than younger people. They are often fearful of being cheated or "taken." For example, we had put up flyers at a senior center from which we got no response; later we learned that people thought we might be trying to sell them something. Cold calling from a database. This is probably again because older people are afraid that they may be scammed into buying something. Calling with a personal connection. If we could say that a mutual acquaintance had suggested the contact, potential participants were much more receptive to hearing about the study and considering taking part. It is important to establish credibility and trust with the potential participant. Being careful in the initial call to say where we had gotten the contact information and that we weren't selling anything. Recruiting participants in their 70s and 80s is more difficult than recruiting participants in their 50s. The oldest candidates are less receptive to strangers phoning them, and they don't check email as frequently. Recruiting by phone. Phoning is important. Plan to phone potential participants at least once (or have your recruiters do so). You need to quickly establish credibility and trustworthiness, to assure potential participants that you are not selling anything, and to establish a connection by letting them know where you got their names. When you can do that, potential participants are often glad to hear from a real person. It is also easier for them to determine legitimacy and to ask questions about the study on the phone. They'll use your answers to help them decide whether they want to take part. Recruiting by email. Email can be very efficient for younger participants; it's less so with adults in their later 60s and 70s and older. Give yourself more time for these older participants; they generally don't check their email more than a couple of times per week. This happens for a variety of reasons: They don't feel the need to check mail frequently. They use a computer at a senior centre or a library. They have limited time available through their Internet service provider. As suspicious as older adults are of telemarketers, they are also vigilant about spam. If your email address is unknown to them, without an appropriately descriptive subject line, they may delete it. Always put on a very clear subject line. Screening older adults demands specificity. Many older users when asked the question "what do you do online?" answer "email." They often don't think about practical activities such as banking or bill paying online as "using the web." Many older users are also not as familiar with the language of the web as younger users are. They don't distinguish between the Internet and the web. They don't always know the difference between the web browser and the web page. We found that self-reported data about frequency of use and numbers of hours spent online were not good indicators of proficiency, either. For example, we had one participant who spent 60 hours per week online. We didn't find out until the session started that her sole use of the web was playing games on four web sites that her friend had set up as separate shortcuts on her desktop. 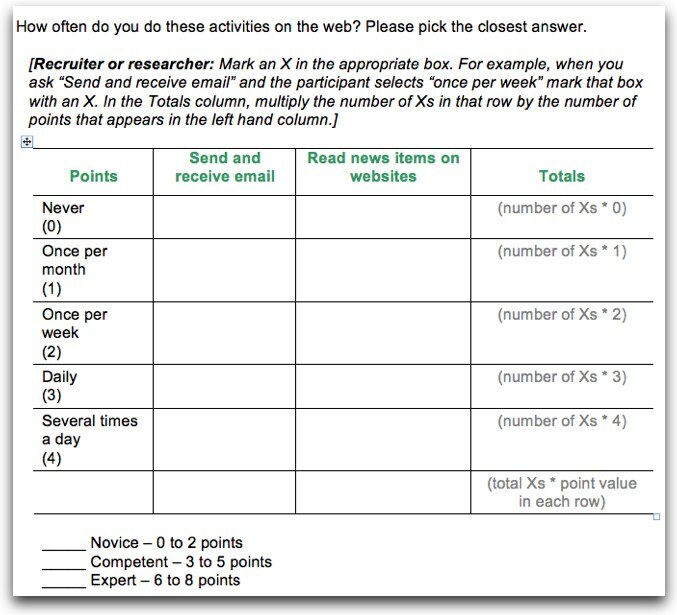 So, asking a variety of specific questions to gauge potential participants' familiarity with the web can help the person recruiting participants for a study make judgments about how suited the person might be for the study. Even if you're looking for a mix of proficiency levels, you still have to be able to determine where in the range a potential participant fits. An assessment we’ve found to work well asks about frequency of use over a broad range of types of interactions older people can take part in on the web. 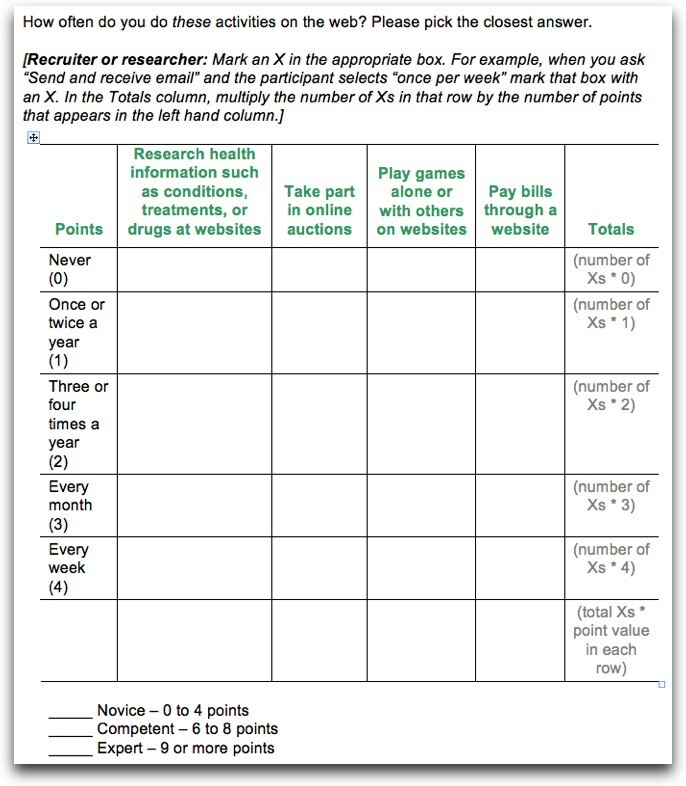 Here are some example assessment grids we have used. Scheduling sessions with older participants can present some logistical challenges that you might not think about in studies involving younger participants. They arrive early. Because many older people are retired (or at least have ample free time), they almost always arrive for their sessions early – up to an hour early. Be sure to have someone to greet them and set up a comfortable place for them to wait. They bring their spouses. Older participants often bring their spouses or a friend with them. They may have travelled some distance to get to the session; they may have planned activities for after their session; or they simply may not like driving alone. Have magazines, a phone, and a comfortable chair available for the spouse or friend. They do best in the morning. Even though people in their later 60s, 70s, and 80s are vital and energetic, they usually have more—and better—attention to give earlier in the day. Try to schedule people who are in their late 60s, 70s and 80s in the morning and save any afternoon sessions for participants in their 50s or early 60s. We don't recommend running evening sessions. They don't like driving in rush hour. If you are holding sessions in a central place (rather than meeting participants in their homes or workplaces), schedule the sessions outside of peak traffic times, if possible. Reminders about one-to-one sessions. Participants can become nervous and uncomfortable if they realize after arriving that they will be the only participant in the session. Usability studies are still fairly new to the general population. Recruiting firms often recruit for focus groups, and participants who come through these firms often assume that they are coming to a focus group. "You will be videotaped and observed by people you won't be able to see during the session." "This is a one-on-one session. You will be the only participant in the study room with a moderator." Special reminders for older adults. Computer glasses. Many participants will have special glasses for using the computer. So another important reminder is, "Don't forget your computer glasses!" Eat first. Also, for long sessions— anything longer than 45 minutes— ask participants to make sure they eat before they arrive. Because many participants expect to take part in focus groups rather than individual sessions, they also expect to be fed. If you have snacks available, try to have fruit and nuts or other relatively healthy food. Many older participants are diabetic. Many older participants won't know what to expect coming into a usability study session. Be clear in setting their expectations and be firm but polite about keeping the session focused on what you're trying to find out. Make participants comfortable. Be respectful without being patronizing. You can be a neutral moderator but still be polite. "Please" and "thank you" are important. Many older adults expect more statements of politeness like these than younger participants do. Clearly explain the session plan, timing, and what they can expect. Warn participants that you'll interrupt them and that you may stop them before they have completed tasks. Schedule breaks for long sessions (and tell them they can take breaks whenever they need to). Have them practice thinking aloud. Consider including a practice task to help participants understand how the session will work. Take account of beliefs that participants may have learned or created about how to work with computers. Remember that older participants often are not versed in computer and web terminology, so avoid using this jargon when working with them. Be extra patient with older participants; wait longer than you normally might to prompt; consider giving participants permission to ask for hints. If participants stop talking, consider letting them continue that way; try reflecting on the task later. Teach participants something at the end of the session. Keep them on track tactfully. Most of the participants we've had in sessions are interesting, charming, and very talkative. Many older participants have a lot of stories to tell. Their stories say a lot about who they are, and where they have been— and often provide a context for interpreting data. But it may be easy for participants to get off track during the session, and while it may feel awkward or mean sometimes, it is the moderator's job to keep the participant focused on the task, talking about it, and getting data for the study. This is the main reason for warning participants in the introduction to the session that you may interrupt them and that you may stop tasks before they've completed them. Listen for their beliefs about computers and the web. Many people who are in their late 60s and older never used computers at work. This means they have no previous experience from which to make inferences about how a computer or an application might work. Many learn how to use computers and the Internet through friends, family, and neighbours. They inherit the superstitions and myths that those people have developed to help themselves work around problems. Then the older adults bring these myths into sessions with them, and you'll hear about them as task-solving strategies and workarounds. It's important to capture these; they are part of the users' reality and we have to deal with these beliefs when we design web sites. Be careful of the words you use; avoid computer jargon. Older computer users rarely know much about computer-related terminology, so you should avoid using these terms during your sessions. 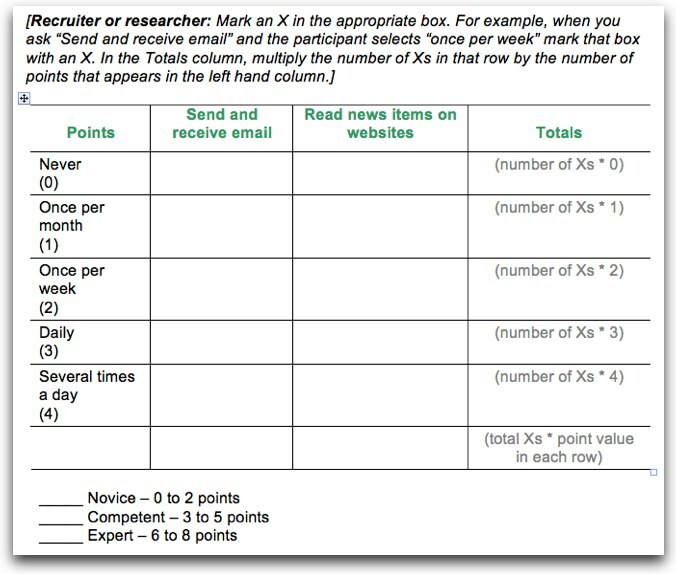 Older participants often don't know the names of widgets such as drop-down boxes or cascading menus. Most of our participants also had little knowledge of web-related terminology. For example, they weren't sure about terms such as "link," "URL," and "login." Many were unclear about the meanings of "online community" and "message boards." "Browsing" wasn't always meaningful in the context of a feature called "browse by topic." The word "emoticon" and the concept behind it were completely foreign to most of our participants. This means that you must pay close attention to what participants do and point at on the screen or device. Give them time. Older participants almost always take longer to do tasks than younger participants. And, although they seem to struggle, the oldest participants also expect using the computer to be difficult. Plan for tasks to take much longer for older participants than they would for younger participants—up to 25 percent longer in our experience. Help participants understand the time constraints of the session by explaining the session format in your introduction. Also, wait longer to prompt than you normally might. You might also consider giving participants permission to ask for hints when you introduce the session. If necessary, hold the think-aloud and ask participants to reflect later. A classic technique in usability testing is to ask participants to think aloud while they work through tasks toward a goal. When tasks become complex or difficult, participants may stop talking. Use your best judgment about nudging them to tell you what they're thinking. For some participants with short-term memory loss or other cognitive impairment (such as that caused by pain medication), your asking for their thoughts may interrupt their task enough that it causes them to make errors. In those cases, you may get more usable data without the think aloud protocol by asking participants to reflect later. Don't lead even when you want to. If, as a session moderator, you have a soft spot in your heart at all for participants, working with older participants will exercise that spot a lot. You may be tempted to give hints; worse, you may lead them in ways you don't intend. Be patient and firm but polite while keeping to your agenda. When appropriate, teach something at the end. If the session has been difficult for the participant, or, if there is some small thing that would make using the computer or the web easier, take a little time at the end of the session to teach the participant something. For example, show participants how to change the text size in their browsers and shortcuts for copying and pasting and printing. Older adults don’t behave differently from younger people online. Just thinking about old age as a collection of disabilities is old business. The new world of designing for older adults is about creating web sites and other technology that is useful and desirable as well as accessible to the broadest range of users. Older adults as a cohort are living longer than their parents because they’re healthier, and many will be affluent because they’ve been saving up for a lifetime – this means they have time, money, and motivation to be online. Neither a monolithic view of older adults nor an entirely separate design for older adults is necessary. Younger designers developing web sites for older adults need to learn more about older adults’ life experiences. For example, many older adults don’t perceive themselves as old. And so, all technology design – not just designs for older adults – should involve users. In testing a site recently with some friends (in their 60s), I found that many of things you warned of were true. I was amazed at how they wanted to please me with the "right" answers and apologized when they didn't "get it" when, in fact, the website in question was the problem. Great post. Should be required reading for usability testers! I find most of the emphasis for enterprise UX is on the influx of younger workers/employees and customers. But I think we need to recognize in the enterprise that older workers will likely begin to work longer for a variety of reasons: better health maintenance past age 65, possibly an extended retirement age, avoiding the loss through retirement of a huge pool of very experienced workers, etc. Because I work in financial services, which includes products for retirement planning and income protection, we usually do include older participants for usability testing external-facing online experiences. We might do well to remember to include at least some older participants when working on internal-facing employee online experiences. For some of these employees, the transition to a world of enterprise social media and employee self service will be jarring to say the least. It's the very nature of work as a face-to-face social activity that is a motivator for some older workers. Therefore I would characterize social media in the enterprise as having a different impact on older users than social media used to keep in contact with friends and family. Loved all the practical tips in this post. It also struck me how much of it applies to everyone. Example: "emoticon", a word that I'm sure my non-UX friends wouldn't recognise. As a young-ish member of this demographic in an early adopter family, I find this post refreshing and pertinent. I am always learning from observing my elder colleagues as they use the web and would like to remind developers that elders are the fastest growing demographic of new users to the internet, social media and mobile devices. One idea many struggle with is a fear of 'breaking the computer' by making the wrong choices online or venturing off the beaten path to explore. Helping folks feel comfortable with taking chances online is half the battle. This is a nice article. Good insights. Usability testing takes place in a formal environment so you can control what will actually do, but doesn't take into consideration how persistent people are in trying to complete their task.